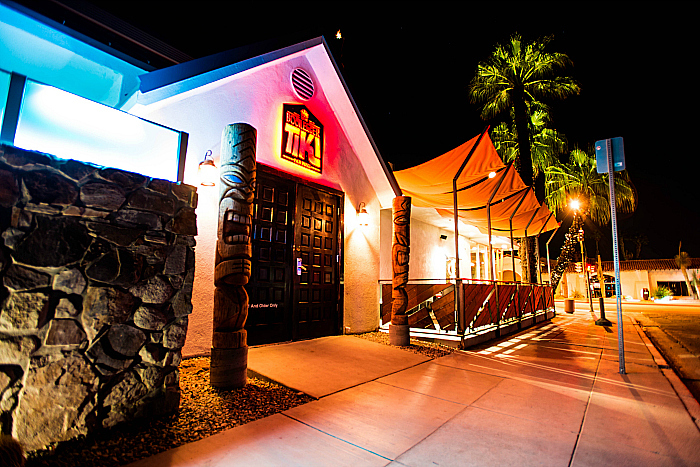 Intertwined with the mid-century vibe of Palm Springs is the niche category of Tiki. From the 1930s through the 1960s, Polynesian (and pseudo-Polynesian) influence in pop culture was paramount. 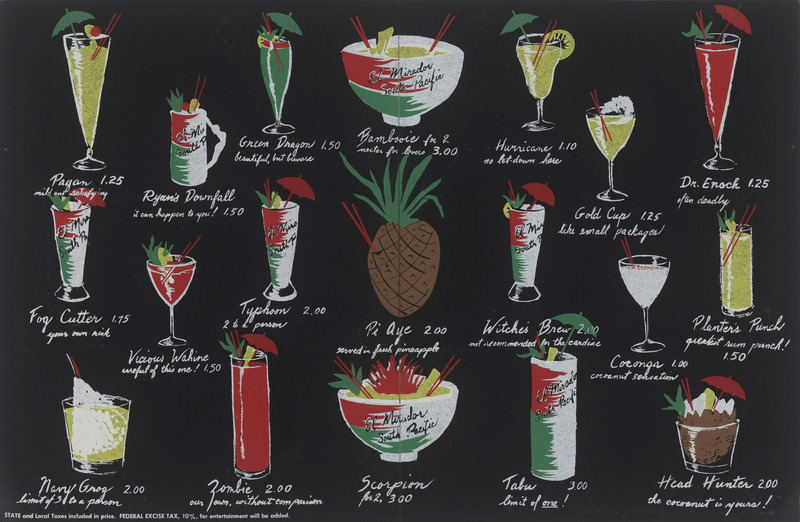 Tiki-themed restaurants were in every major city of the United States and in many small towns, too! Rum-based cocktails were garnished with orchids and fruit rinds and secret recipes kept customers coming back to their favorite boîtes to imbibe these tasty libations. Restaurants were festooned with all manner of nautical and Hawaiian ephemera, and patrons in aloha wear added to the festive atmosphere. Palm Springs was no exception! Let’s take a short drive through town to tour our Tiki History. The El Mirador Hotel on Indian Canyon just north of Tachevah had a South Pacific Room with tropical cocktails and a floor show. Nowadays it’s the site of Desert Regional Hospital and any cocktails are more likely to be injected than imbibed. Turn left out of the hospital parking lot and make a right on Tachevah and you’ll be facing the site of Don the Beachcomber, which opened in 1953 at the corner of North Palm Canyon and Via Lola in the Sunset Towers building erected in 1951. The building underwent extensive renovations beginning in 2012 and is once again the site of a great tiki bar – Bootleger Tiki. 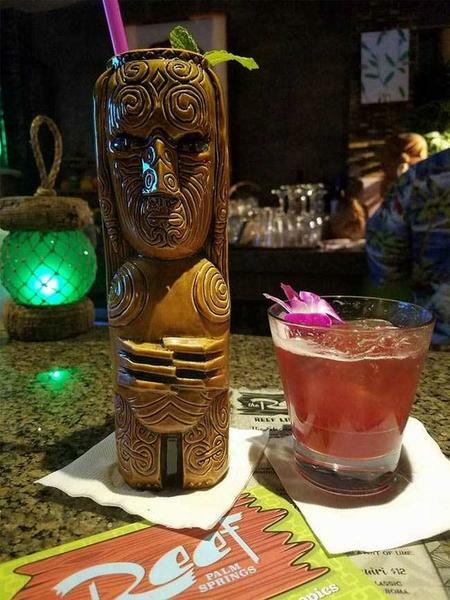 Bootlegger Tiki occupies only a small portion of the original Don the Beachcomber footprint at 1101 North Palm Canyon, but it serves up tasty, well-crafted original tiki-inspired drinks that are worthy of Don’s legacy. Co-owner Gregory Mandallaz also operates Ernest Coffee (named for Ernest Raymond Beaumont Gantt, the birth name of beachcomber Don himself) in front of the Bootlegger space, facing North Palm Canyon and will also be opening a new cocktail and small-plates venue next door in the coming year. Check back here periodically for our updates on new Palm Springs bars and restaurants. If you continue west on Via Lola, drive through the Old Las Palmas neighborhood and cross Monte Vista, you will enter the Vista Las Palmas neighborhood, site of a dozen or so Charles DuBois-designed Polynesian-influenced, bold A-Frame homes. These gems rarely come up for sale, and when they do, they sell quickly to modernist enthusiasts. Contact us to hear about these properties before they hit the market. There will be more residential and commercial Tiki Architecture as we continue our tour south. But for now, let’s just head back west to Palm Canyon and turn right.
. Just across the street and down a bit at 217 N Palm Canyon was Chi Chi’s. 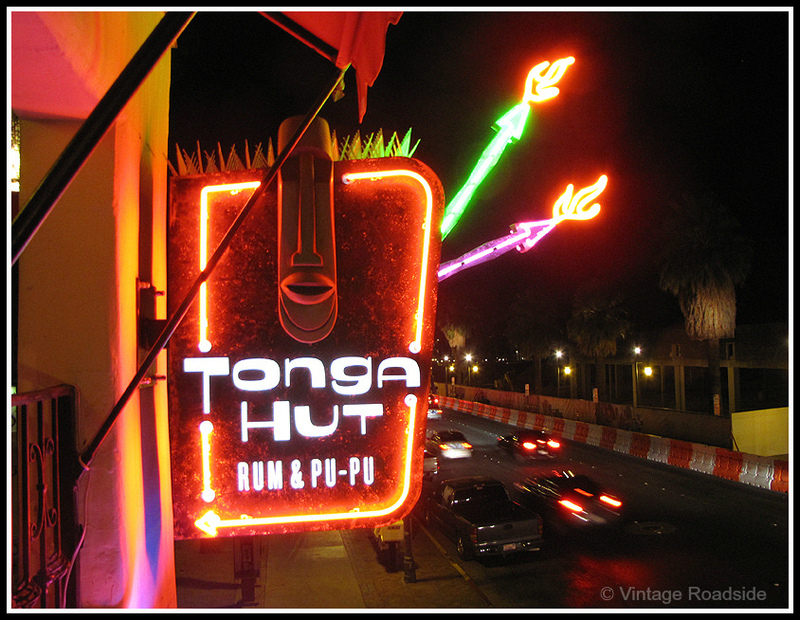 While not technically a Tiki Restaurant, it certainly had some Polynesian Pop influences, not least of which was the Edgar Leeteg-painted Hina Rapa logo, popularly known as the Chi Chi Girl. 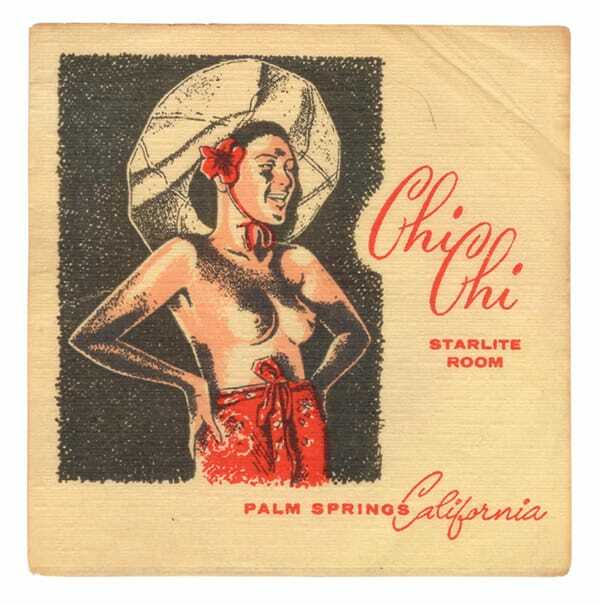 The Startlite Room at the Chi Chi opened in 1948 with Desi Arnaz’s orchestra performing, and club evolved over the years hosting just about every big name entertainer that came through Palm Springs traveling to or from Los Angeles – Nat King Cole, Ella Fitzgerald, Bob Hope, Lucille Ball. The list goes on and on. In this location now is a new building housing West Elm and Blaze Pizza. Waltah Clarke’s Hawaiian Shop sold aloha wear in Palm Springs for 30 years. He opened his first Palm Springs shop in the El Mirador Hotel in 1952, but later moved to 136 South Palm Canyon in 1956, near where Peabody’s is today. 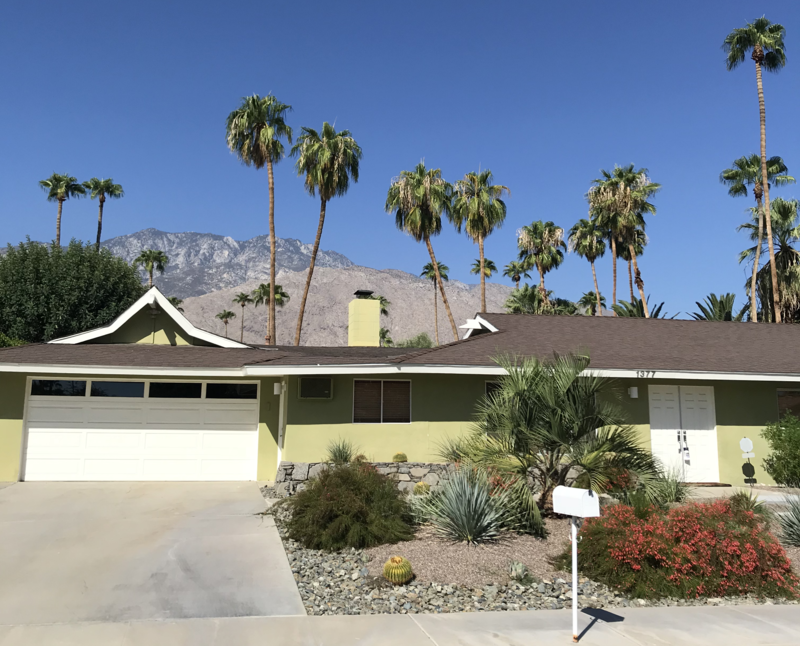 He remained on Palm Canyon in different locations for the next 36 years. His final Palm Springs shop was in the storefront that currently houses Trini Turk, so his legacy of bold colorful designs for men and women is alive and well today. Vintage Waltah Clarke resort wear (when you can find it!) holds up very well against contemporary designs and can still be found adorning discerning fashionistas in Palm Springs today. 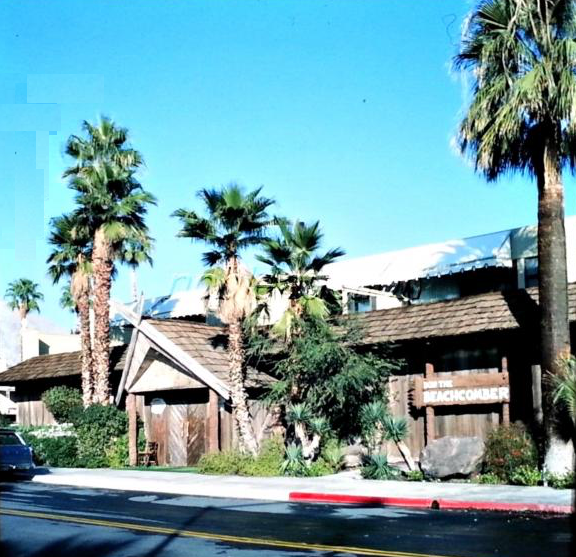 Aloha Jhoe, once at 950 South Palm Canyon, had a Polynesian-themed décor that was very different to many others and was designed by Oscar-winning Art Director Lyle Wheeler (Gone with the Wind, The King & I, The Robe). Sadly now this site, between Sunny Dunes and Mesquite is just a vacant lot awaiting new development. If you continue on South Palm Canyon instead of following the main road to the east, you’ll happen upon the uber-tiki Royal Hawaiian Estates condominium complex. 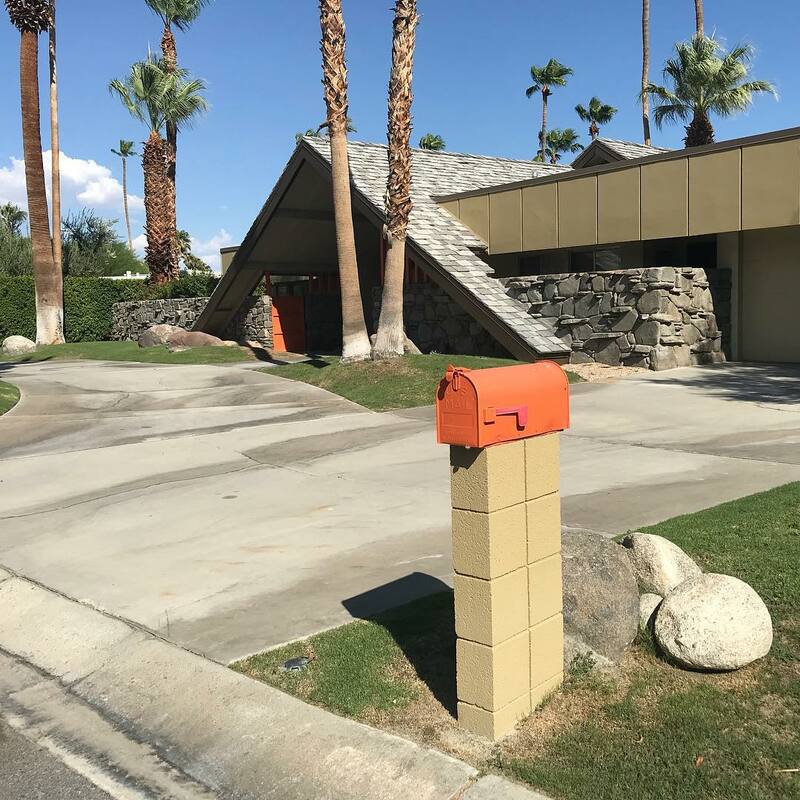 Lovingly restored by its residents, this historical landmark complex designed by famed modernist architects Donald Wexler and Richard Harrison in 1960 features bright orange “flying-7” buttresses and many other great period details! 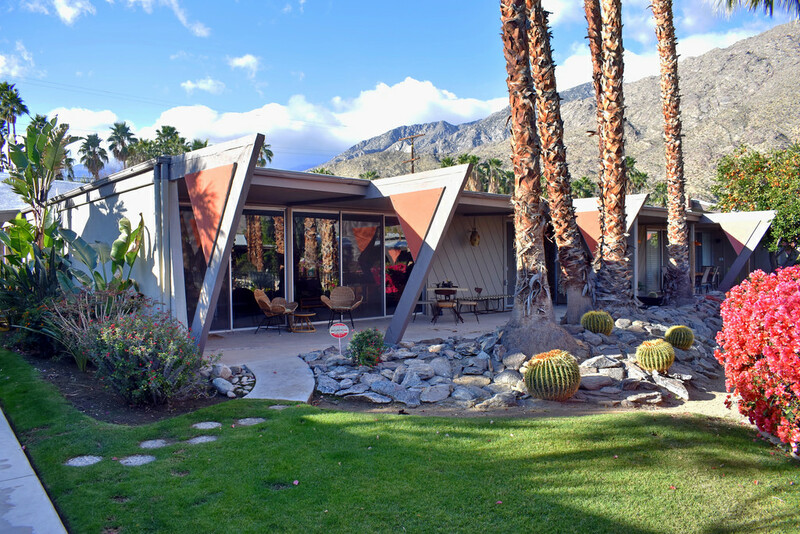 The HOA hosts a tour of the complex for Modernism Week every year also, raising funds to continue its painstaking preservation. Head back to East Palm Canyon from the Royal Hawaiian and make a right, The Reef is located in the Caliente Tropics hotel in the south part of town at 411 East Palm Canyon and is enthusiastically decorated by owner and host Rory Snyder with his eclectic collection of tiki ephemera. The hotel also hosts the annual Tiki Caliente weekend every spring and tiki enthusiasts from all over travel to Palm Springs to enjoy the sunshine, attend room parties, enjoy live music and sip sweet cocktails by the pool. 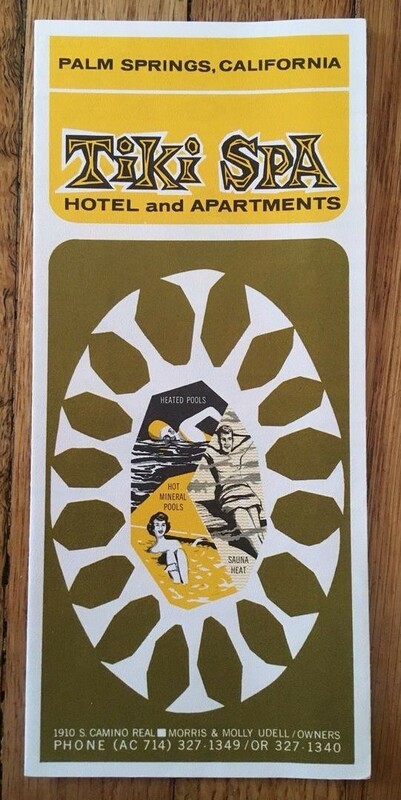 Just past the current-day Ace Hotel, hang a right on Camino Real and you’ll find the site of what was once the Tiki Spa Hotel, a small mom-and-pop resort that sadly saw its demise shortly after the death of the original owners. It was de-tikified and the protruding ceiling beams were sawn off in an attempt to contemporize it, but the roof lines remain an indelible marker of the once-charming buildings. Now, Michael’s House occupies this space, providing rehabilitation services. Turn around and get back onto East Palm Canyon and follow it to Farrell and make a left turn. On your right hand side is the edge of the Los Compadres neighborhood. Within this neighborhood, there are some more subtle Polynesian-inspired homes. These have the telltale double-hipped roofs of modernist Hawaiian homes, and there is some speculation that they may be attributable to Charles DuBois.